The TVS Motor Company has launched its new 125cc scooter, NTorq 125 at Rs 58,750. This is TVS' first 125cc scooter and has been under development for four years. The Ntorq's, 125cc, 3-valve, air-cooled, single-cylinder engine produces 9.4PS at 7,500rpm and 10.5Nm at 5,500rpm. Power is sent to the rear wheel via a V-Matic transmission. TVS claims the NTorq125 can sprint from 0-60kmph in 9 seconds and has a top speed of 95kmph. The NTorq 125 looks sharp and edg, borrowing design cues from the TVS Graphite concept that was displayed previously at the Auto Expo. At first glance, the fit and finish looks impressive. Among the highlights of the TVS NTorq 125 is the fully digital instrument cluster with Bluetooth connectivity. Besides, displaying the vehicle speed and fuel level it shows oil temperature, 0-60kmph time, top speed, average speed and lap timer. In addition, it also has navigation assist that displays the directions to your destination. There's a TVS NTorq 125 mobile app (available on Android) that needs to be downloaded to run the above-mentioned feature. 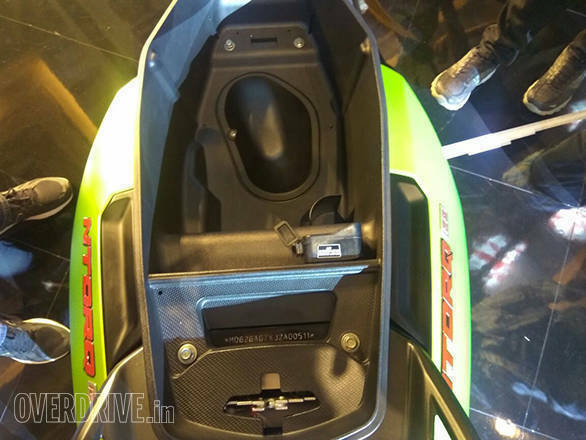 The underneath boot space is a generous 22 litres and comes with a mobile charging port as standard. 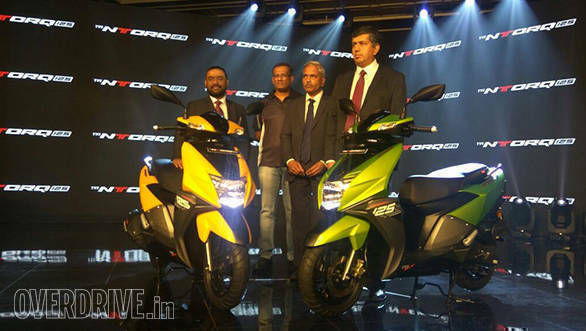 TVS says that the NTorq 125 is aimed at today's youth. It is styled to reflect their taste in design and features. It also promises to offer excellent ride and handling. We shall get you a ride report soon and tell you more about the TVS NTorq 125.